Did you know that June is Audiobook month? I didn’t, at least not until I started seeing people post things about it. And there’s a good reason I didn’t know – I just don’t do audiobooks. So, why discuss them if I don’t use them? Because I want to. I love the idea of having a book playing while I’m in the car driving to work (20 mins, one way, which means 40 minutes daily!) or having one on my iPod to play while I’m doing chores around the house. It seems like the perfect solution for those days when I can’t seem to make myself get anything done because all I want to do is read. And yet, I can’t make myself get into them. I’ll admit this is partly because my library doesn’t have a great selection locally, but I could inter-library-loan them like I do most of my books. If I could decide what to order, that is. Instead of branching out, and trying to read new things by audiobook I find myself doing re-reads that way, if I use audiobooks at all – it’s been several years since I’ve even tried, and the last one I remember is Harry Potter and the Goblet of Fire, just before Order of the Phoenix came out (I’d love to buy all of those on audiobook – they’d probably be go-to audiobooks for me). 1) I read faster than they can. By miles. I can zoom through a book like Anna and the French Kiss in the space of 2.5 hours. The audiobook takes TEN and a half. I feel like I would get a third of the way in, get frustrated that I want to know what happens so bad and it’s taking so long, and just give up and start reading the book myself. 2) I’m afraid I won’t pay attention. There’s a big difference for me between “listening” and “paying attention.” “Listening” is what I do when I’m working on something else – I put music on in the background and sometimes I don’t even notice it until 5 or 10 songs later, if at all. I have to do it that way. I have such strong aural training from being a musician that if I actually pay attention I start noticing all these cool little details of what they’re doing with the music and I don’t get anything else done. I’m afraid the same principles will apply to listening to audiobooks, and even if I do manage to make it through an entire book that way, afterwards I’ll have no idea what happened. Hence, sticking to rereads – I already know what happens so it doesn’t matter if I don’t pay attention 100% of the time. 3) I’m afraid the experience will be different. No, scratch that, I know the experience will be different, and I’m afraid I won’t like it. I have so many good memories of days spent curled up on the couch, in the car, in bed, wherever with the perfect book. I was slow transitioning to an ereader because I love the feel of a book in my hands. It’s even worse with an audiobook – nothing to hold at all! Despite all my fears, I really want to try to get into audiobooks. There are so many good reasons to, not the least of which is that if I actually give them a chance, then I can say whether I like them or not, instead of just never having tried them. I signed up for Audible, and I’m still trying to decide what to download first (and trying to convince myself to not go with an old favorite like I really want to). Also Sync is doing a summer of free downloads, if you have Overdrive, so I went ahead and downloaded the first one (Eleventh Plague by Jeff Hirsch, available until 6/20). So, I guess the good news is I’m trying! Do you use/read audiobooks? Do you have a favorite you think I should try? Am I just being silly with all these fears, or have you found some of these things to be true for you? 1. For me, audiobooks are less about how fast it goes, and more about getting a book “read” when I would normally be able to (e.g., in the car, on my walk into work). 2. I’m good at tuning things out, too. The key is to pick the right audiobook. If you’re interested, you will listen. Also, I’ve found that I can do anything that involves reading text while listening. I focus on the text and not the audio. 3. There are some books that are actually BETTER in audiobook. The Iron Druid Chronicles by Keven Hearne and Beauty Queens by Libba Bray are excellent examples. 4. They are. I haven’t really found a way around this yet, but I’m sure I will. If you like adult urban fantasy, I’d strongly recommended getting Hounded by Kevin Hearne on audiobook. PS. I’ve also written about my experience with audiobooks here. Like I said in my comment, Audible has great prices. Much better to pay $11-$14 (or sometimes way less!) for an audiobook (that you could listen to on your iPod on Android) than $40+ for the physical audiobook. If you’re really worried, I would ask people who listen to a lot of audiobooks. They should have some good suggestions. The thing is, a bad narrator can ruin a book. You do have to be careful. That’s awesome that you’re trying! I just got into audiobooks this year (well, I listened to one last year, but it was kind of crappy with bad quality) and I love them. I’ve listened to a variety of them and there are some that are hit and miss. Like ‘Code Name Verity’ — that was one of mine where I was LISTENING, but not PAYING ATTENTION. There was too much going on in the book and the narrator had a thick accent, so I decided to nix it and put the physical book on hold. I totally understand about the time thing, too. BUT, the way I look at it is that I could spend the whole day running errands or doing things around the house — time where I wouldn’t be reading anyway. If that’s going to take up 8 hours in a day, why not listen to an audiobook — even if it would be quicker for me to read it? My favourites so far are Will Grayson, Will Grayson — the narrators are awesome in this one! And the book is pretty good, too. Or, you could try an autobiography/memoir type of book — Jane Lynch’s Happy Accidents is really good, one that I listened to in the car. Or, I’m just now listening to Steve Martin’s Born Standing Up, which isn’t bad. As for the pricing thing, I get some of mine through the library, but they’re usually on CD. I went out and bought a discman just so I could keep listening to them when I’m at home. I also signed up for Audible, which was $7.49 per month for the first 3 months, then $14-something for each month after that. Not a bad price. You can even get 2 credits from them in a month, which would be something like $11 per book. And they have great sales on all the time — I got Will Grayson, Will Grayson for $4.95 and Wonder for $5.95. Those aren’t bad prices! I hope you keep giving them a try! Next week is audiobook week, which I’m participating in, so you could see lots of great reviews and articles about audiobooks which may give you some more ideas. Oh I’ll definitely have to stop by for your suggestions. That’s another of the big things stopping me – I never know which audiobooks to pick, because I want to physically *read* them all, so I need suggestions for ones that are truly GREAT to get me into it. I don’t do audiobooks at all. Like you, I can read so much faster and I don’t know that I’d be able to concentrate. BUT, as Amanda and other bloggers have said, they’re great for when you wouldn’t normally be able to read. That’s the one draw for me. I have an hour/hour and a half commute every week. If I could maybe try an audiobook just once in that time, maybe I’d find that I’m more open to them. But I’m so so so so so so so so hesitant…. *glares at you* Just do it, Alissa! Download one of the free audioboook titles offered by SYNC or get one from your local library and try it. Dooooooo it. They make driving so much better. You can’t pressure me with your glares! I say again – Book bully much Amanda? Especially taking away the coffee! My goodness! I don’t drink the stuff myself, but from what I hear that’s just cruel and unusual punishment! I hope the Eleventh Plague works for you and gets you hooked! Yeah, seems like there’s a consensus about the pros and cons here lol. I’m hoping I can get into it, because I’d love to have books in the car – I’m getting SO frustrated with the radio stations because I’m forced to listen to a certain one at work and they all play the SAME FIVE SONGS over and over again. So, if I had an audiobook, I would have something to listen to that *isn’t* those five songs! Win, win situation, right? 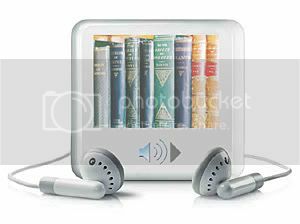 I LOVE audiobooks – but it wasn’t always this way. Key for me is using the library online (which uses Overdrive). I belong to 2 library systems, so I can access audiobooks on both -it increases the choices I have available, and of course makes it affordable. Another thing is knowing what I like – it has to be a fast paced book, typically YA or zombie type – that way I’m actively listening. There are some books that are enhanced by audio (I loved Daughter of Smoke & Bone which is going to be one of the free SYNC books); and I’ve learned that there are some I don’t like on audio – when there is time shifts in each chapter (for example Visit from a Goon Squad) which also is told from multiple point of views adding to the complication. And if a book doesn’t grab me in 20 minutes – I move on to something else – thankfully I belong to an awesome library system that has some good choices. Since I use the library, I typically look through whatever is available at the time and pick my book that way – I look at it as “free reading” – not from a list or anything that I might have otherwise chosen. I have an hour commute each way to work and I don’t listen to the radio, so audiobooks are a great way to use this time. I had similar reservations like yours before I started listening to audio books. (And they ARE pricey. I normally borrow them from the library). I’ve managed to lose myself in audios which was whole-hardheartedly unexpected. and you’re right a different experience. I finished listening to The Daughter of Smoke and Bone and think that the audio made it a richer experience than I could.